James Reid was born in Newry, Ireland in 1799, son of Jane Moore and Samuel Reid. He was only 24 years of age and his new wife Rosanna 17 when they embarked on the Skelton in 1822 to begin a new life in Australia. There were a total of forty-four passengers on the Skelton including William Gunn, Mr. Strachan and family, Rev. A. McArthur, Mr. R. McKrusty, Mr. L. Dickson, Mr. D. Maziere, Mrs. Larra, Mr. H. Cundell, Miss N. Cundell, Mr. T. Watson, Mr. and Mrs. Pearson, Mr. A. Dickson, Mr. R. Campbell, Mr. G. Scott, Mr. R. Doctor, Mr. J. Dickson and family, Mr. T. McClean, Mr. D. Dkirvin, Mr. J. Rae and family, Mr. G. Dobson and family, Mr. B. Yates, Miss Yates, Mr. R. Knotman, Mr. G. Brown, Mr. F. Rose, Mr. A. Downey and Mr. T. Knox. as it was nearly seventy miles by water from the settlement which was attended with much inconvenience as the boat was between two and three days on the passage up without having a safe place to stop and the chance of robbery and liability of having the supplies spoiled as also the grain going to market. He hoped to be granted about 300 acres and would not have requested such a large a grant were it not that the banks of the river were liable to be flooded and he had to retreat some distance from the banks to build a safe house. James and Rosanna and six servants were granted permission for victualling from His Majesty's Stores for six months. Rosebrook adjoined the estates of Timothy Nowlan and William Hicks and was situated five miles from Wallis Plains. James Reid was also promised 560 acres, parish of Wolfingham by Sir Ralph Darling on 15th January 1829 as an additional grant, the deeds being re-advertised for Mr. Wentworth in 1839. There was also an allotment of land in the town of Newcastle granted in 1823 which can be seen on the map below in Pacific Street adjoining the allotment of Vicars Jacob; and later other allotments were acquired in Newcastle as well. Rosanna Reid gave birth to a daughter Anna in October 1824 at Vicars Jacob's residence in Sydney. In 1826 another daughter Ann Australia was born at Rosebrook. Rosanna was born in 1829, Anna Maria born 1830, Margaret Adelaide Louise born 1836 and Jane Moore Reid born in August 1838. Their only son James Macartney Reid was born in 1835. In 1824 James Reid was involved in a dispute with Captain Gillman of Newcastle when Gillman issued a warrant to search the house of settler Vicars Jacob. The much publicised case divided the little settlement at Newcastle with many taking up the side of Captain Gillman who was thought justified in his actions. In 1825 Reid was requesting from the Government an advance of flour. This followed the burning of his house at Rosebrook by bushrangers 'Jacob's Mob' in August 1825, supposedly in revenge for Reid's treatment of convicts. In 1827 the Rosebrook estate was offered for sale and James Reid was said to be returning to Europe. On the estate was a seven room house with veranda 62ft in front; kitchen, store, barn and stockyards. Rosebrook does not appear to have been sold and James and Rosanna were living at Rosebrook when their daughters Rosanna and and Anna Maria were baptised at Christ Church Newcastle in May 1830. James Reid must have been a familiar face around the town for many years. In 1847 a Ball was held at James Reid's premises in honour of Sir Charles Fitzroy's visit to Newcastle. Sir Charles had been enthusiastically received at Newcastle on 3rd February 1847. He was accompanied to Rouse's Hotel by many of the respectable townsfolk including Rev. C. P. N. Wilton and Major Crummer. Afterwards the town address was presented followed by presentations from the Odd Fellows and the Mechanics' Institute. A tour of the town took place when His Excellency was accompanied by his suite, Capt. Moriarty, and Majors Innes, Macpherson, and Crummer, Mr. James Reid, the Rev. C. P. N. Wilton, Mr. Charles Bolton, the sub-collector of customs, Captain Richard Furlong, J.P., Mr. John Allman, J.P., and a few other gentlemen. all on horseback. His Excellency visited Nobby's Island, the Stockade, and the Gaol, from which latter establishment Sir Charles discharged a confine, an aboriginal native, who was imprisoned for some trifling offence. After lunch at Rouse's they proceeded to Stockton on the Stockade boat to inspect the cloth manufactory of Messrs. Fisher and Donaldson; also, their foundry; and the salt works of A. W. Scott, Esq. Later a dinner was held at Croft's Victoria Hotel in which the Governor travelled in the carriage of townsman, John Smith, Esq., After a sumptuous dinner in elegant surroundings with about forty five of the townsfolk including James Reid, Esq., who officiated as Vice; Captain Furlong, Dr. Stacy, George Darby and Alexander Brown, Esqs., acted as stewards. Toasts were given and at about quarter past eleven His Excellency and suite left the table and proceeded to the house of James Reid to attend the Ball, which was numerously and fashionably attended. Sir Charles left Mr. Reid's at rather an early hour after his arrival there, owing to the fatigue of the day, and from not having had any rest the previous night on board the steamer. The Governor left Newcastle the following morning on the steamer Tamar. James and Rosanna Reid's eldest daughter Anne married Maitland solicitor John Hawkes Valentine Turner in October 1842 at Christ Church Newcastle . Third daughter Rosanna Amelia married Alexander Ogilvie Grant on 21st April 1851 at Newcastle. Anna Maria Reid married George Hyde in 1852.
" That fellow Darby is a liar and a scoundrel, he has broken his promise ; I took him for a gentleman, as his father was, but I find I am mistaken ; he is a liar and a scoundrel ; he cannot get on without me, and I'll ruin his school." The declaration contained three other counts, charging words of similar character as being uttered on three other occasions ; by reason of which defamation many scholars left the plaintiff's school. To these counts the defendant pleaded generally not guilty, and on this issue was joined. Counsel for the plaintiff, Mr. Darvall and Mr. Meymott ; counsel for the defendant, the Solicitor General and Mr. Purefoy. Mr. Meymott opened the pleading. Mr. Darvall stated the case to the jury. This was a new trial of a cause tried at the last Maitland Circuit Court, and by the ruling of the full court certain evidence improperly rejected on the first trial would now be allowed to be given, the evidence being of other words spoken on other occasions than those named in the declaration, to show the animus of the defendant. The learned counsel entered into the case at great length, but as the general circumstances disclosed at the first trial will be fresh in the minds of the readers of the Mercury, a brief report of the principal points and new facts will be sufficient. The learned counsel contended that the words spoken were not only in themselves malicious and slanderous, but that he should prove such a continued series of malicious remarks and annoying acts against the plaintiff on the part of the defendant, that he was satisfied the jury would not only give a verdict for the plaintiff, but such damages as they thought the case merited. The witnesses called for the plaintiff were the Rev. C. P. N. Wilton, Mr. Simon Kemp, Mr. Alexander Flood, Captain Alexander Livingstone, Mr. George Tully, Richard Brownlow, Clarence Hannell, and Mary Cooper. Mr. George Darby, a schoolmaster, residing at Newcastle, occupied a house belonging to Mr. Reid, and under the same roof and verandah with an adjoining house occupied by Mr. Reid. Mr. Reid told several of plaintiffs witnesses that he, wanting to let his own house, had arranged with Mr. Darby that the latter should move, by obtaining one of the vacant government buildings in the town, and that thus Mr. Reid could move with his family into the house then occupied by Mr. Darby ; no direct proof was given that Mr. Darby ever admitted that he had made such an arrangement, or made any promise to quit the house, but Mr. Reid, acting under the belief that he had done so, let his own house to Mr. Gaunson ; Mr. Darby appears to have failed in obtaining any government building, (assuming that he made the attempt, under the arrangement spoken of by Mr. Reid) and he refused to quit Mr. Reid's house ; Mr. Reid tried to induce or compel him to do so, but failing, he (Mr. Reid) quitted his own house to allow Mr. Gaunson to take possession, and removed with his family from Newcastle to Rosebrook, some 25 or 28 miles from Newcastle. Mr. Reid appears to have been very anxious not to be compelled to take this step, as one of his daughters was very ill, and the long and hot journey was likely to be very injurious to her. On the 30th December,1850, Mr. Reid employed Mr. Flood to serve a notice to quit on Mr. Darby, and went to the house with Mr. Flood ; Mr. Darby did not appear to to be in but to his housekeeper, who took the notice, Mr. Reid, who was in an angry and excited state,-said that "Darby was a d-d liar and a -scoundrel" and that he would injure his prospects for life. Early in January, 1851, on a day he could not fix, the Rev. Mr. Wilton was at Mr. Darby's house, and was told by him of something Mr. Reid had said ; on leaving Mr.Darby's house, Mr. Wilton saw Mr. Reid at his window, and believing Mr. Reid beckoned to him Mr. Wilton went to the door, which was opened by Mr. Reid, and they went together into Mr. Reid's parlour, where two or three of the ladies of the family then were ; Mr. Reid appeared very angry about his dispute with Mr. Darby and said "That fellow Darby is a liar and a scoundrel ; He promised to leave his house, .but he has 'broken his promise : I had taken him for a gentleman, as his father was, whom I knew, but I find that I am mistaken ; he is a liar and a scoundrel." Mr. Wilton said it was a pity to use such expressions, as perhaps he might have mis understood the nature of Mr. Darby's promise. Mr. Reid then used similar words, adding " He can't get on without me, and I'll ruin his school; he won't have any pupils; if he doesn't quit the house by Tuesday next, and so prevent my leaving Newcastle and going up to Rosebrook, I'll have him up to the police office, and ask in open court whether a liar and a scoundrel be a fit person to have the care and instruction of youth." Mr. Reid also told Mr. Wilton about his having let his own house to Mr. Gaunson, who might bring an action against him if he did not fulfil his promise, and also about his daughter's being very ill, and that she would suffer great harm if he was compelled to go to Rosebrook ; that Darby had promised to leave the house for him, and he ought to keep his pro- mise. Mr. Wilton that same day went to Mr. Darby's, and repeated to him what had passed, and enquired if some arrangement could not be made by which he could quit the house, and let Mr. Reid come in. On an early day in January Mr. Kemp was going into a public room at Messrs. Mitchell and Tully's stores, used as a kind of exchange room by the captains of ships in harbour, when Mr. Reid followed him, laid his hand on his shoulder, and said " Your friend Darby is a d- d lying scoundrel ; I mistook him for a gentleman ; I am sorry I did." Mr. Kemp told him he did not like to hear such words used of a man whom Mr. Reid styled his "friend." Mr. Reid then repeated the words, and stating the circumstances above related respecting the houses and his having to leave Newcastle himself to make room for Mr. Gaunson, Mr. Reid added, " I've risen Darby's rent from 50 to 80 pounds, and I'll put an execution in every quarter for 20, and sell him off till l've ruined him." Mr. Kemp told Mr. Reid he had himself (Mr. Reid) ; been the means of preventing Mr. Darby from .getting the government building, as he well knew. There were six or eight captains in the room at this time, writing, reading, and sipping grog, and this language, uttered by Mr. Reid in an angry and excited manner, drew the attention of these parties. On another occasion Mr. Reid told Mr. Tully of the .circumstances about the houses, and said that " Darby had disappointed him, that Darby was a liar, and had told him a lie on the occasion. It was also stated generally by different witnesses that Mr. Reid, when he met with them uttered similar expressions respecting Mr. Darby in reference to this transaction, appearing always full of it. Masters Brownlow and Hannell, who were formerly scholars in Mr. Darby's school, described noises that for about a week, soon after the return of Mr. Reid and his family from Rosebrook, use to almost stop the school business, and on one day obliged Mr. Darby to break up the school ; the school-room, situate at the back of Mr. Darby's house, was only divided from a room or outhouse on Mr. Reid's premise by a wooden partition, and on Mr. Reid's side of this petition a couple of bells were kept ringing with brief intervals, varied by the clashing of tin dishes, the throwing down of boards, and by singing performed by Mr. Reid to these musical accompaniments. Mr. Darby's servant girl, now Mrs. Cooper, one fine morning saw Mr. Reid sitting on his back doorstep, composedly pulling away at a ring fastened to the two bells, then giving forth sweet sounds. It was proved by Mr. Wilton that up to the time of the quarrel Mr. Reid had been always a warm friend of Mr. Darby's, assisting him in every way. Mr. Darby, it appeared, retained possession of the house until December, 1851, when he gave it up, and also gave up the school, getting an appointment as surveyor under the A. A. Company. By 1861 James and Rosanna had returned to England.....In the 1861 census James Reid (Reed) age 70, Rosanna age 63 resided at St. Leonards on Sea, Sussex. His occupation was given as fund holder and land proprietor. Their grand daughter Anna Turner aged 16 resided with them. They employed a cook and a housemaid and there was a 22 years year old visitor Emily Macartney also residing with them. Rosanna Reid died in Germany in 1871 and James Reid died at Brussels on 4th December 1878 age 89. Over towards the western boundary there is a grave which contains the remains of the only son of James Reid, one of the early residents of Newcastle, and also those of his son in law Captain Hyde, and three grandchildren. The inscription on the stone reads - Sacred to the memory of James Macartney, only son of James Reid Esq., of Newcastle, who departed this life 1 May 1852 in the 17th year of his age.....James Reid, or as he was familiarly called, Long Reid, was an officer in the 56th regt., who retired from the service with the rank of major, and came to NSW in 1822, settling in Newcastle about that time. He became interested in a squatting pursuits, and owned a large tract of country at Rosebrook, Lambs Valley and Gosforth, on the Hunter adjoining the present home of Mr. Beresford Hudson, in that locality and a station out west, being one of the early pioneers who crossed the Blue Mountains and took up land at Bathurst where he had a station for some years. It was he who built the present Baden Powell Hotel formerly known as the Caledonian, and his private house, which now stands at the top of Watt Street is one of the oldest buildings in the city. It is now divided into two residences but was originally one, and in its time was the best house in the district. A store used by Major Reid in his business still exists behind the offices of Messrs Dalgety and Co., which, together with the dwelling mentioned was erected somewhere about 1824. It is interesting to note that he was the owner of two thousand acres of land where the town of Wallsend now stands. A portion of this property was sold to Mr. A. Brown, the father of Mr. J. Brown of the Hetton Coal company. The purchaser at once started boring for coal and about two years later disposed of the property to the founders of the Wallsend Company, receiving 25 thousand pounds, part in cash and part in shares, for what cost less then as many hundreds. Major Reid married Miss Macartney, a niece of Dean Macartney of Melbourne, whose father sat in the Irish Parliament before the union. When the Australian Bank suspended payment, Major Reid, in common with others, suffered severe losses, and retired to his property at Rosebrook. There, one wild stormy night, on which one of his daughters (Mrs. Rooke) was born, the convict servants set fire to the house and Major Reid had to take his wife in the pouring rain to a tent from which he watched the destruction of the building. There were several children by the union, including Mrs. Rooke, Mrs. Turner, whose husband was the original owner of Minmi colliery, Mrs. Grant, whose husband was police magistrate at Bourke and Mrs Hyde, whose husband Captain George Hyde, and their three children, are buried in the grave mentioned. Major Reid's only son died of consumption contracted by hardships and exposure in travelling to the goldfields. His death was a great blow to the father, who returned to England in 1858 and died later on in Germany. Ancestry.com. 1861 England Census. Original data: Census Returns of England and Wales, 1861. Kew, Surrey, England: The National Archives. Source: Class: RG 9; Piece: 561; Folio: 152; Page: 21; GSU roll: 542662. Sydney Morning Herald 19 February 1879. Sydney Morning Herald 11 October 1842 . 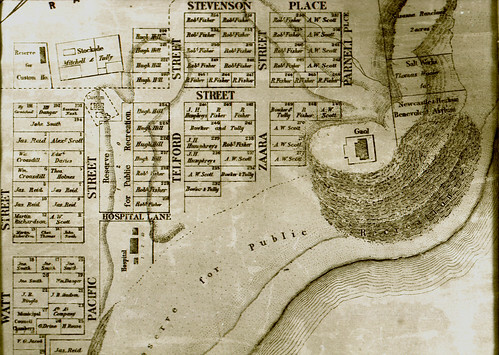 Map of the township of Newcastle - Cross, Joseph. 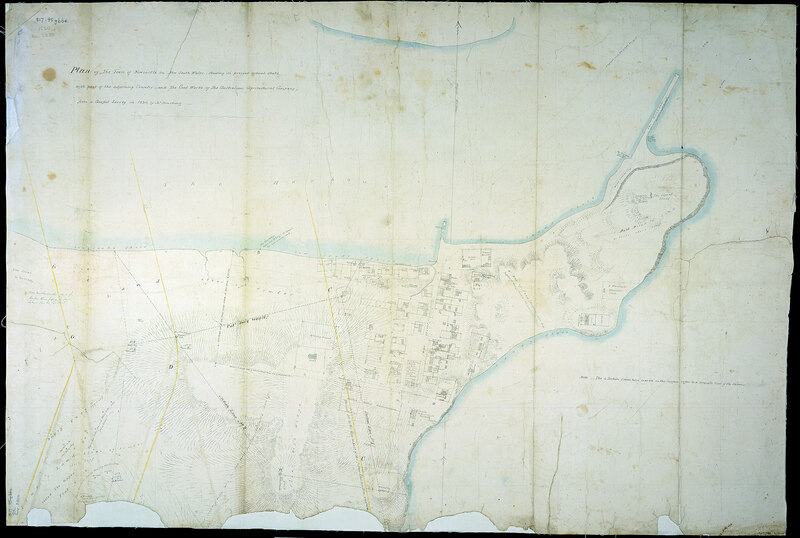 Map of the River Hunter, and its branches [cartographic material] shewing the Lands reserved thereon for Church purposes, the Locations made to Settlers, and the Settlement and part of the Lands of the Australian Agricultural Company at Port Stephens together with the Station of the Mission to the Aborigines belonging to the London Missionary Society on Lake Macquarie, New South Wales 1828. MAP NK 646.